Hip-Hop came about amidst major cultural and political upheaval in New York City. Battling has always been a part of the culture, It was a way to earn street credibility. The whole concept of MCing has been very competitive from the very beginning. When one thinks of Classic battles- Kool Moe Dee verses Busy Bee comes to mind. Also, it's hard to think of classic battles without thinking of The Fantastic Romantic 5 verses The Cold Crush Brothers, a battle that is disputed to this day. These days Smack URL continues the legacy of MC battles. 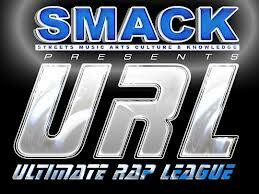 Smack URL (Ultimate Rap League) is the UFC of MCing. Smack URL battles are a throw back to a more exciting era in Hip-Hop culture. With some attention to detail, the battles can be an eye-catching sceptical. There have already been Smack URL battles that are considered legendary classics. The Smack URL battle Between Loaded Lux and Calico is at the top of the list of those battles that are already being considered classic. This lyrical war is the topic a many conversations. It is being talked about by folks in the underground as well as the commercial rap culture. Watch to judge who the winner is.